Interpal has taken down part of a video that infringed the copyright of UK Lawyers for Israel (UKLFI). The video, entitled “How will you cheque on Palestine?”, encouraged donations to Interpal by cheque, standing order or cash. 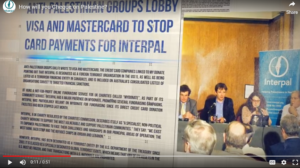 Interpal produced the video after their credit card donation facilities were withdrawn in October 2018 (see link) when UKLFI pointed out to the credit card companies that Interpal is designated as a terrorist entity by the U.S. Treasury Department. BT had also removed Interpal from its My Donate platform in August 2018 (see link) following UKLFI’s submission. Interpal has, it seems, been trying to plug the gap by encouraging donations by other means, such as cash, standing orders and cheques. 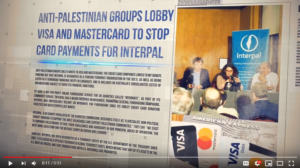 A photograph of credit cards was used in Interpal’s video, to illustrate how, as the voiceover says: “organisations working with the Palestinian people have been hindered and scrutinised”. But this photo had been copied from UKLFI’s website! 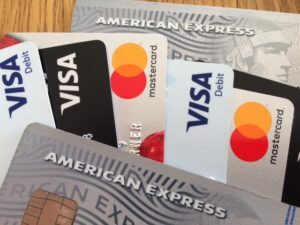 It had been specially created by UKLFI to illustrate our story about credit card facilities being withdrawn from some other Palestinian NGOs. (see link). UKLFI wrote to Interpal and Youtube, pointing out the breach of copyright. The photo has now been removed from the video on Interpal’s website and You Tube.